Secretary of State Mike Pompeo speaks about the release of the Trafficking in Persons report at the State Department June 28, 2018 in Washington, DC. 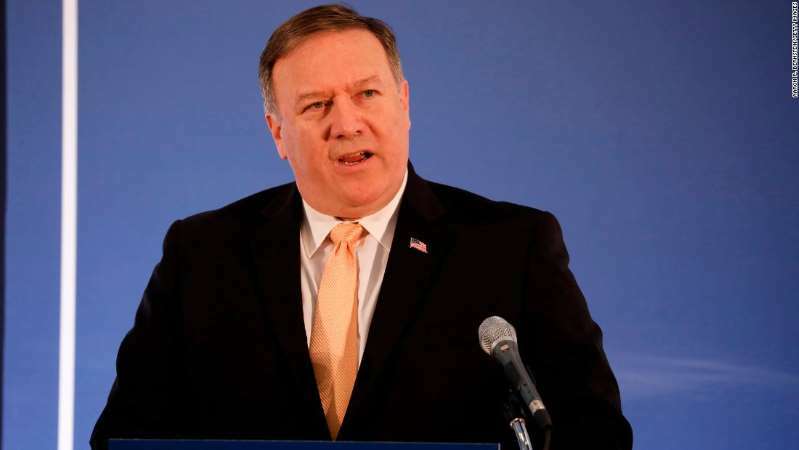 Secretary of State Mike Pompeo heads to North Korea on Thursday under pressure to produce tangible signs of progress as US intelligence reports cast doubt on Kim Jong Un's intention to dismantle his nuclear and missile programs. [post_ads]The top US diplomat has offered few details about the state of negotiations following the June summit in Singapore between Kim and President Donald Trump, but knows he must return from his third trip to North Korea in as many months with concrete plans for a path forward, sources tell CNN. "Pompeo has already been to Pyongyang twice and -- as Singapore made clear -- came away with very little to show on the core US interest of denuclearization," according to John Hannah, senior counselor at Foundation for Defense of Democracies and former senior adviser to Bill Clinton's Secretary of State Warren Christopher. "It should not happen a third time without Kim understanding that -- while diplomacy might continue -- there will be consequences in terms of a ratcheting up of the maximum pressure campaign, and certainly no prospect of another summit with President Trump," Hannah said about Pompeo's upcoming trip. While Pompeo has told CNN that he is not willing to lay out a timeline for talks, he noted that he wants to see continued progress showing Kim is serious about dismantling his nuclear program and that he plans to discuss next steps when the two meet this week. But Kim's sincerity when it comes to taking apart his nuclear and missile program remains a major question mark. CNN reported this week that the Defense Intelligence Agency believes that Kim has no intention of engaging in a full denuclearization program, at least for now, according to an administration official familiar with the agency's finding. The Washington Post earlier reported on US intelligence officials' doubt that North Korea intends to fully surrender its nuclear stockpile and recent commercial satellite imagery has shown some continuing activity at various nuclear fuel and missile sites. A senior State Department official told CNN they are not surprised at the reports, believing Pyongyang is playing hardball before negotiations start in earnest. The same senior official told CNN that the North Koreans know that they need to produce evidence to prove their seriousness. An intelligence official told CNN last week that the administration plans to present the North Koreans with a detailed list of tasks they must undertake to begin a denuclearization process. Nearly all the experienced officials at the State Department and the National Security Council working on the North Korea issue -- including Pompeo himself -- remain skeptical of Kim's willingness to denuclearize given Pyongyang's long history of misleading the US, officials familiar with the talks said. These officials view negotiations as something that's worth pursuing, but realize they have an uphill battle, according to a source familiar with the situation. Pompeo and his team of experts know the North Koreans have a track record of delays and obfuscation, but feel previous issues should not preclude an attempt to strike a deal, the senior State Department official said. Kim "reaffirmed his firm and unwavering commitment to complete denuclearization of the Korean Peninsula" in a signed agreement after his Singapore summit with Trump. But longtime North Korea watchers worry that Pyongyang and Washington have very different definitions of the term denuclearization -- an issue that could present a challenge for Pompeo as he attempts to hash out the details of a binding agreement. "To ensure that it is not just being 'played' by North Korea, the administration will be under increasing pressure to demonstrate that real progress has been achieved on denuclearization and that Kim Jong Un has in fact made the strategic decision to rid himself of nukes and missiles in exchange for security and economic benefits," Hannah said. Pompeo faces another challenge as he returns to Pyongyang. The US has said if North Korea lags in its promises to denuclearize, it will quickly ratchet up the "maximum pressure" campaign that brought North Korea to the table with economic sanctions. But Kim has been careful to hedge his bets in the wake of his summit with Trump, travelling to Beijing just days after his trip to Singapore for a celebratory meeting with Chinese President Xi Jinping. Kim and Russian President Vladimir Putin may also meet in the near future. That new diplomacy could give Kim the room to undermine the "maximum pressure" campaign, particularly with China. Bill Richardson, the former US energy secretary, ambassador and repeat US envoy to North Korea, said Xi holds the power to loosen sanctions that are biting the North Korean economy by looking the other way on cross-border smuggling and energy restrictions imposed by the US and United Nations. "I believe Kim Jong Un is trying to delay denuclearization and do it at his own pace," he said, noting that can be accomplished only with sanctions relief from China. Beijing fears instability in North Korea that could send desperate refugees flooding across its borders or even worse, lead to the prospect of US troops moving into North Korea as a stabilizing force and right to Chinese borders.